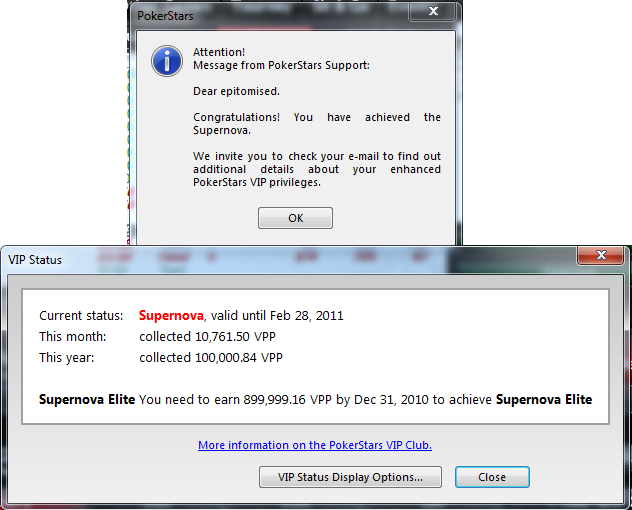 James Atkin's Poker Blog Dusk 'til dawn SNQ UKICOOP Supernova Quest Completed! I actually completed my quest to become Supernova in 2010 in underwhelming fashion. I pretty much stopped grinding on December 7th, knowing I had it effectively locked up. I fancied playing the UKICOOP events which kind of distracted me into playing MTTs for a while. With a big 2011 lined up SNG wise, I decided I didn't want to grind SNGs anymore after that. I actually made the last 2000 VPPs playing a bit of limit hold 'em and after getting a taste for mixed games after playing the UKICOOP H.O.R.S.E. 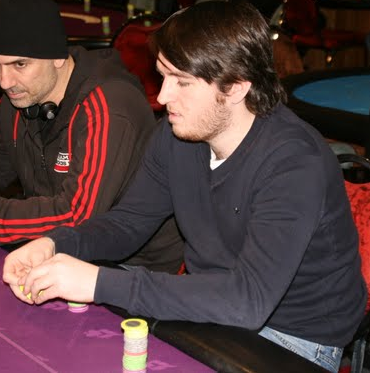 tournament, I actually crossed the finishing line playing some Razz cash games?! Not grinding SNGs for the last couple of weeks has actually made me feel a little bit of a degenerate. Playing 4 or 5 days worth of MTTs is pretty much gambling. Playing a small number of hands at Limit Hold 'em is also pretty much gambling. Me playing Razz is definitely gambling! SNG wise I pretty much do zero gambling, so even though I wasn't risking very much the last couple of weeks, I think dicking about with other games and not making fairly steady money as I am used to hasn't made me feel all that great. I had some deep runs in 3 or 4 MTTs, but didn't make it to the big bucks. I was in a huge pot to be a clear chip leader in the UKICOOP main event about 6 hours in, but I didn't get there. Perhaps if I'd have binked something I wouldn't be complaining! It's no biggie though, I will make up for it come January 1st when the real grind begins. One of my former students has actually got me out of a bit of a tight spot. Having not made much money at the tables this month, and very possibly being in the process of being grimmed at the moment, finances weren't quite as comfortable as I'd have liked them to be. However, I had 10% of Ray Norton, who I talked of being my 'star student' here, who managed to finish 3rd in the £1000+90 DTD "Monte Carlo" Event over the weekend for £27,500, which has taken a bit of pressure off. I'm so pleased for him, he's been a good mate since we started coaching and it's a great reward for the hard work he's put in at the tables this year. Having bust out the event on Day One myself, I was routing on Ray throughout the epic Blonde Poker Live Update throughout the final day. He is very much a grinder similar to myself, and it was great to see him doing so well in this deepstack live tournament (which has the EPT Grand Final structure) and get a score that will mean a lot to him. The whole Blonde Poker forum rallied behind him like I've never seen before, with many people, myself including staying up until 4am to see how things turned out for him. Had two unlucky chopped-pots where he was AIPF with dominating Aces gone his way, he might have done even better. An awesome Christmas present for him, but I know he's got his own quest to Supernova to complete before the years end, and with 8000 VPPs or so to go I hope he finds some time away from his celebrations to put in the necessary grind! Perhaps I have been too down-tone in this blog post. I am very pleased the have made Supernova for the first time :) Wiiiiiiiiii. 6 Comments to "Supernova Quest Completed!" Well bud buddy, good job, I like the way it says only 900000 to get by end of month for Elite.